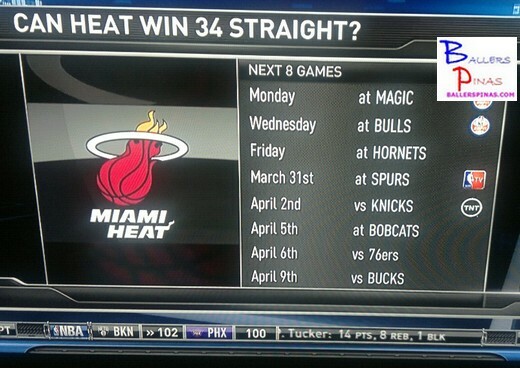 Can The Heat Win 34 Straight Games To Beat The LA Lakers ' Record? Vote Now! The Miami Heat have won 26 games in a row. Their latest victim was the Charlotte Bobcats. 8 more wins and they will eclipse the historic 33 Game Winning streak of the Jerry West led 1971-72 LA Lakers Team. Jerry West himself is rooting for the Heat to beat their long standing record. But the thing is, the Heat will still have to face tough teams including the San Antonio Spurs. Can the Heat win 34 straight games? Vote now! Can the Heat win 34th Straight?